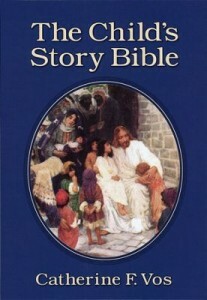 At the end of 2013, I purchased “The Child’s Story Bible” by Catherine F. Vos to read with my son this upcoming year. We’ve been through several children’s Bibles so far (“100 Bible Stories, 100 Bible Songs”, “The Jesus Storybook Bible”, etc. ), but I feel like he’s reached the age where he can grasp more theologically about the stories, so I wanted a Bible that went a little “deeper.” After listening to an audio message on the Redeemer Presbyterian website by Mrs. Wilson Benton (see this post where the link to the audio messages is included), I decided to go with “The Child’s Story Bible” as it was recommended and the speaker noted that she knew of many college age students who still loved to read the book as it was so beautifully written. What a great find! I’ve never heard of it prior to this audio message, but boy is this Bible a jewel! First of all, it covers much, much more of the Bible than most children’s Bibles do. For instance, we are up to Chapter 19 of this Bible so far (to the story of Jacob deceiving his father in Genesis) and to my knowledge, every chapter up to Genesis 27 has been thoroughly covered in great detail. I’ll give you an example. My son has a fear of the “Adam and Eve” story. Whenever we question him about why the story bothers him, he simply says “because they disobeyed” (and doesn’t want to talk about it). He has such a fear of the story, that each week of Sunday school I have to ask the teachers what story they are covering because he has had two meltdowns in the classroom when they discussed the Adam and Eve story! So, this Bible didn’t have a picture of Adam & Eve next to the story so he could ask me to “skip this story” (it is definitely more of a “real” first Bible as opposed to a picture book), so I just started reading the story and here’s what happened. This “Adam and Eve” story goes into much greater detail. It starts with how the wicked devil was once an angel in heaven, but was banished from heaven because of his wickedness. Then, it goes into how the devil wanted to spoil God’s beautiful world because he hated God. After describing Adam and Eve disobeying, this Bible goes into “the terrible result of sin” and “a loss and a promise” and does a good job of explaining the change – where the man and the woman no longer wanted to be good, no longer wanted to please God, and had angry and selfish hearts that began to do wicked things. This Bible explains how because of this, there is something in my heart, and in yours, that makes us want to do wrong, because we have bad, sinful hearts. Then, this Bible goes into something I personally have never even thought about before – how sin affected Adam and Eve when they had their own children…”How sad Adam and Eve must have felt when they saw their son lying dead upon the ground. They had seen dead animals before, but no man had ever died. Just a short time ago Abel had been full of life, talking and running and working. Now he lay on the ground dead. And Adam and Eve knew it was their own sin which had brought death into the world. Oh, if only they had not disobeyed God!” Also, the Bible touches upon their loss not only with Abel’s death, but because Cain was sent away by God, and how they never saw him again either. As a parent, I cannot imagine the guilt and loss they must have felt. At any rate, this Bible is very detailed and thought-provoking, and I realized after reading it that my son was no longer terrified of the Adam and Eve story. It’s like he understood the greater force of evil behind the temptation now (after understanding how much the devil hates God and wants to hurt his creation) and he also was able to connect the dots better on how Adam and Eve are just like us, and their hearts and their wickedness are no different than ours. At any rate, this Bible is a great find and I really think would be used by children their whole lives. Like I said, I am truly enjoying it as well. I purchased mine on Amazon. Look it up and see what you think!